2015 Domaine Maurice Schoech, Riesling, Sonnenberg, Vin d’Alsace, France. I have tried a few older vintages of Schoech and have always admired the brightness and purity in the wines, but this 2015 seems a step up in terms of quality and depth of flavors, this Sonnenberg Riesling is beautiful, mineral driven and crisply focused dry wine that is electric in the glass. The Domaine Maurice Schoech is run by Maurice’s sons Jean-Léon and Sebastien Schoech and the modern family estate was founded in 1971 on the edge of the village of Ammerschwihr, though their roots go back as far as 1650 in the region and they have many ancient records and artifacts from their history on display at their cellar. The Riesling Sonnenberg is sourced from a collection of old-vine parcels that are planted to massale selections of regional Riesling clones on a south-facing granite slope in the Sonnenberg lieu-dit making for an intense and ripe dry wine of precision with sharp detailing and a real kick of vibrant acidity, it feels at first light and lithe, but gains presence in the glass, though always svelte and not showy with any flab at all, it keeps it’s laser focus throughout, impressive and crafted with studied finesse. Schoech also makes a Grand Cru field blend, like Marcel Deiss as well as doing one of the of best Pinot Auxerrois bottlings I’ve ever had, this is a winery to check out. This 2015 Sonnenberg Riesling was whole berry pressed and fermented with native yeasts, aged on the lees and raised in stainless steel vats for 12 months without fining and with low sulfur. Schoech is converting to all organic and about half of their holdings have been certified, and all their vines are hand harvested and worked with great attention to the environment and their wines have great and vivid energy. Layers of lime, crisp white rose, flinty wet stones and peach lead the way here along with a steely core of citrus and stone fruits as well as a touch of chamomile, kumquat and lemongrass. 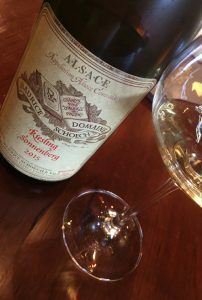 This pretty Vin d’Alsace Riesling is zippy and refreshing and subtle in style, but rewards the palate and slowly seduces, showing it’s charms especially well with cuisine, it also should age well too, drink it over the coming decade.